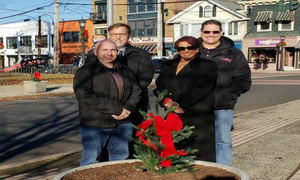 Milford Progress, Inc. (MPI), an organization made up of business and community members dedicated to economic development in the City of Milford, has decked out downtown for the holidays with new planters and wreaths to adorn sidewalks and utility poles. The planters currently hold small evergreen trees, which will be replaced with spring bulbs following the winter season. This project is a culmination of efforts with the Downtown Milford Business Association (DMBA) to improve business, as well as to enhance the experience of our residents and visitors alike. MPI, in tandem with the City of Milford and other organizations dedicated to improving the quality of life and business in the City, will continue to work on beautification efforts along with multi-modal options, wayfinding, tourism and more.